Cork Deluxe is environmentally friendly, it is composed mainly of natural and renewable materials (cork granules, linseed oil, resin clumping, dry pigments, ...) This combination offers great durability and strength, it is an ideal product for frequent use and will keep its original appearance over the years. You can display your documents with pushpins, its texture has the advantage of resealing the unsightly holes. Deluxe Cork is very easy to clean and has bacteriostatic properties. It stops the multiplication of bacteria without destroying them and prevents dust from accumulating on the surface. It's a smart choice for environments with children or sick people. It offers a wide choice of colors which allows your tackboard to match your environment and your tastes. 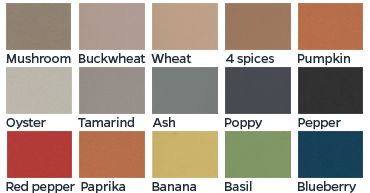 You can opt for a classic color for greater discretion or select a original color for the decoration of your premises.